Yves here. Investment lore is full of sayings as to how the bond markets can send false positives about lousy prospects for the real economy and the stock market. However, as Wolf sets forth below, a new Moody’s article makes a compelling case as to why the high risk spreads in the junk bond market bode ill for the stock market. After the white-knuckle sell-off of global equities that was finally punctuated by a rally late last week, everyone wants to know: Was this the bottom for stocks? And now Moody’s weighs in with an unwelcome warning. If you want to know where equities are going, look at junk bonds, it says. Specifically, look at the spread in yield between junk bonds and Treasuries. That spread has been widening sharply. And look at the Expected Default Frequency (EDF), a measure of the probability that a company will default over the next 12 months. It has been soaring. They do that when big problems are festering: The Financial Crisis was already in full swing before the yield spread and the EDF reached today’s levels! For now, it’s hard to imagine why the equity market will steady if the US high-yield bond spread remains wider than 800 basis points [8 percentage points]. Taken together, the highest average EDF metric of US/Canadian non-investment-grade companies of the current recovery and its steepest three-month upturn since March 2009 favor an onerous high-yield bond spread of roughly 850 basis points. Moody’s EDF began spiking last summer and has nearly doubled since then to 8%, the highest since 2009. The average spread between high-yield bonds and Treasuries has widened to 813 basis points (8.13 percentage points). 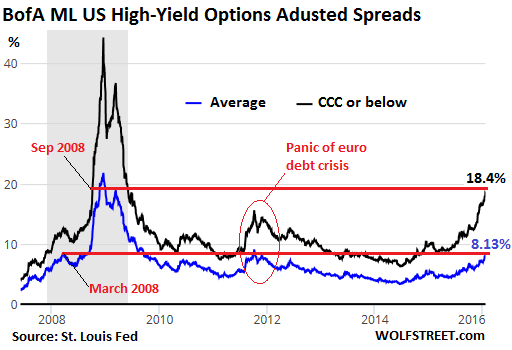 But at the lower end of the junk-bond spectrum (rated CCC and below), the yield spread is a red-hot 18.4 percentage points. So how does the yield spread impact equities and the broader economy? A wider-than 800 basis-point high-yield spread reflects elevated risk aversion that will reduce capital formation and spending by non-investment-grade businesses. In addition, ultra-wide bond yield spreads favor a continuation of equity market volatility that should sap the confidence of businesses and consumers. Which has consequences for stock prices. The premium over market price that acquiring companies pay has been rocket fuel for share price increases in entire sectors as analysts hype the potential for all these companies to receive buyout offers with huge premiums. A cresting by M&A may offer valuable insight regarding the state of the business cycle. The two previous yearlong peaks for US company M&A were set in Q3-2007 at $2.213 trillion and in Q1-2000 at $1.745 trillion. Recessions struck within one year of each of those peaks. But the markets didn’t wait for those official recessions. Stocks began their multi-year crash at the end of those quarters! The buyout frenzy is funded in part by large amounts of debt. As corporations lever up, risks rise and downgrades hail down on them. In 2015, M&A-related “net downgrades” (difference between M&A-related downgrades and upgrades) by Moody’s rose to 36. This year, Moody’s expects them to increase further. The M&A activity last year was fueled by low borrowing costs, high stock market valuations, and “diminished prospects for organic revenue growth,” as Moody’s put it euphemistically: S&P 500 companies waded through four quarters in a row of revenue declines! The importance of the latter helps to explain why record highs for M&A tend to occur close to the end of a business cycle upturn. The urge to merge will be greater the more convinced corporations are of the imperative to meet long-term earnings targets via mergers, acquisitions, or divestitures. M&A is the easy way to growth. But it comes at a high price, increased financial instability, subsequent downsizing and cost-cutting, and slow-moving waves of layoffs that then sap consumer demand and the economy. “In order to supply a more immediate lift to shareholder returns,” Lonski writes, companies lower total shares outstanding by buying back their own shares. This lowers the dilution that occurs when they issue new shares for M&A and executive compensation. These financial engineering tactics have been another type of rocket fuel underneath the market. Sometimes, efforts to enhance shareholder returns trigger credit rating downgrades. Typically, strategies which benefit shareholders at the expense of creditors employ cash- or debt-funded equity buybacks and dividends. So Moody’s downgrades stemming from “shareholder compensation” rose to 48 in 2015 but were still shy of the record 78 in 2007, at the cusp of the Financial Crisis. At some point, market volatility, which means downward volatility because no one lambastes upward volatility, will put a damper on M&A and share buybacks, thus knocking over two of the remaining props under the market. The two latest recessions were partly the consequence of markets not knowing the full extent of deteriorations in household and business credit quality. Not everything can be quantified, if only because some very critical things are hidden. Ah yes, we won’t even really know how bad it is with our over-leveraged corporate heroes until the house of cards comes down to reveal what’s left inside. This entry was posted in Credit markets, Doomsday scenarios, Economic fundamentals, Guest Post, Investment outlook on January 25, 2016 by Yves Smith. 1. Oh, dear — the M & A money and the share buybacks might dry up…? The markets might reveal that managerial capitalism not only eats its own seed corn, it is like a plague of locusts? 2. After seeing The Big Short over the weekend, this feels…. weirdly familiar. It’s a shame that investors are not paying heed to the recent HY market selloff and instead are calling their financial advisors who are telling them this too shall pass. The last time HY debt dipped during European Debt Crisis in 2012, Mario Draghi promised “whatever it takes” and solved the liquidity problems in the bond market. This time is very different. This time it’s the solvency of energy and emerging market debt. This time it’s really bad and can’t be solved by central banks because they are tapped out. Warning: price discovery dead ahead. The M&A and buy back craze is really just a symptom of the slowdown and the lack of pricing power. All the money borrowed to finance it will make the situation even worse. Keep in mind who (or what) these investors are. Most Americans aren’t even in the markets. Those that are usually do so through 401K and various retirement and/or collage funds where they don’t get to make those kinds of decision. Nearly all of the stocks and bonds are held by the 1% or corporations where these are traded through computer algorithms. The market is on auto pilot, yet 30% of the economy is engaged in the practice of watching money. Both are true, but hard to reconcile. Everyone should be issued a $100 HYB and forced to look at its adjusted value everyday to see their wealth about to be destroyed. How would one protect himself? Any thoughts appreciated. Focus on return of capital, which typically revolves around US Government securities. Avoid exchange rate risk, as there is typically a flight to the dollar. In bond market parlance, one would shorten maturity duration and move up in credit. But that’s a step which should have already occurred in December (and arguably sooner). Please bear in mind some of this is currently playing out; the continued drop in oil, for example, and lower equity index levels. Never a bad decision to rebalance one’s personal holdings. Some precious metals in bullion form, held outside of the banking system, is advisable. I suspect so, too. Particularly agree with those market analysts inquiring who is holding the energy derivatives Old Maid card(s). IMO the effects of incremental debt leverage from corporate stock buybacks and M&A will not be the immediate catalyst, but will be felt down the road. I feel like a sophomore in a 600 level seminar. I have way more questions than answers. My first question is: Aren’t the ratings agencies a part of the M&A problem – a huge share of capital going to purchase existing production, not create new production? Why is the risk underestimated on the front end of these deals? Have the ratings agencies been asleep at the wheel, or are they corrupt? Is this piece somewhat like Greenspan’s acknowledgement that his “model was wrong?” And finally, who the heck is buying CCC bonds? I am assuming its the big banks, looking for yield. With the growing EDF, I don’t think a crashing stock market is the biggest threat to the U.S. economy, it is a credit crunch which could flat destroy the banks – which actually means – more QE, more fraud, more, more, more. Anyone (Krugman) who doesn’t believe we need to change the status quo, is fooling themselves. The Big Three Triple AAAs gets but a hand slap!……….continually able to keep up appearances, over their foul achitecture!